This aerial photo shows the Amtrak train that derailed and fell off of a bridge and onto Interstate 5 north of Olympia on Dec. 19, 2017. The federal government would give $2.6 billion to railroads to install emergency train-stopping technologies, so they won’t miss a deadline of December 2018, under a new bill in the U.S. House. The bill is sponsored by Rep. Peter DeFazio, D-Ore., and co-sponsors include six Washington state members. It’s prompted by a Dec. 18 crash in which an Amtrak Cascades train derailed at 78 mph north of Olympia, killing three passengers and injuring dozens. Railroads would be prohibited from launching new passenger routes until the technologies are installed on them, under the Positive Train Control Implementation and Financing Act. 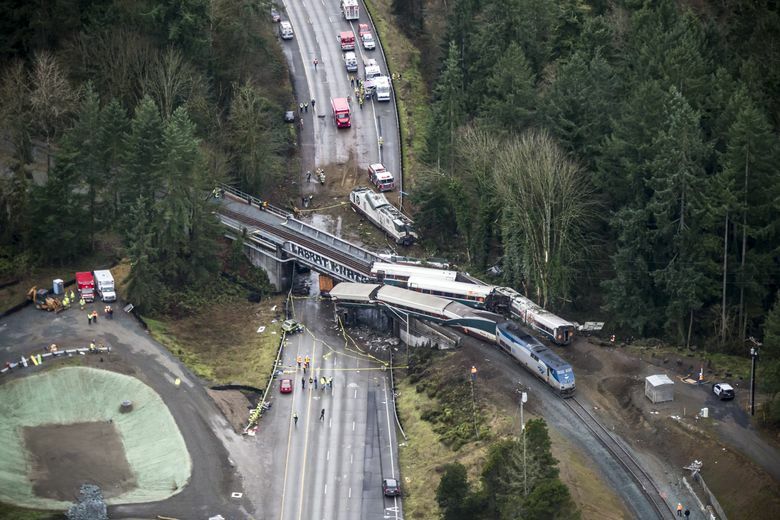 The Cascades crash occurred on its first public passenger trip through a new 14.5-mile stretch, where a century-old freight line was rebuilt to create a direct, faster route from Tacoma to Nisqually. But the $181 million project left in place a 30 mph curve, where tracks approach a freeway overpass. The rail industry was already granted a three-year extension beyond a 2015 deadline set by Congress to install the safety technology. Some companies wanted another two years, until 2020. “No more delays, no more extensions, no more excuses from railroads who have had 10 years to implement PTC (positive train control) technology,” said DeFazio, ranking Democrat on the House Transportation and Infrastructure Committee, to The Hill congressional news site. Amtrak says it has equipped 51 percent of its locomotives with PTC equipment nationally. As for the Cascades line, where Amtrak operates state-owned locomotives, Amtrak promises PTC will be installed and activated “during the third quarter of 2018,” in a letter last week from CEO Richard Anderson to Washington and Oregon transportation directors. The satellite-based system applies brakes if an engineer fails to slow or stop for another train, a switch, a work zone, or a low-speed area. BNSF Railway says its Northwest trains are equipped with PTC. Sound Transit commuter trains have PTC, but the fledgling system doesn’t always boot up. DeFazio’s bill would require Amtrak to issue quarterly progress reports not only for its own routes including the Northeast Corridor, but state-owned lines Amtrak operates — including the Cascades, committee staff said. Seven railroads are at high risk of missing the 2018 deadline, he said in a letter: Trinity Rail Express in Texas, Canadian National, Central Florida Rail Corridor, CSX, Massachusetts Bay Transportation Authority, Norfolk Southern and Metra in Illinois. Four decades have passed since the National Transportation Safety Board (NTSB) recommended train-control systems. Congress finally required them following a Metrolink crash that killed 25 people outside Los Angeles, while the engineer was texting. Washington state Democrats co-sponsoring the bill are Reps. Rick Larsen of Everett, Denny Heck of Olympia, Derek Kilmer of Gig Harbor, Adam Smith of Bellevue, Pramila Jayapal of Seattle and Suzan DelBene of Medina. Rep. Jamie Herrera Beutler, a Republican from Vancouver, has asked DeFazio to list her as a co-sponsor, her staff said late Tuesday. WSDOT moved Amtrak Cascades back to its previous route along Puget Sound, until new train control is ready.